Just 10 games into the 2018-2019 NBA Season, it has become apparent that much has changed since last year. The Cleveland Cavaliers, finals contenders just a year ago, currently sit at last place in the Eastern Conference, and the Houston Rockets, who had the best record in the league last year, have gotten off to a measly 11-1 start. New teams have developed into legitimate title contenders to fill the new vacancies among the NBA’s elite. The Bucks and Nuggets both currently stand as Top 2 teams in their respective conferences; however, only time will tell if their success is sustainable. Constant bottom-feeders have also seemed to make a resurgence this season. To everyone’s surprise, last year’s 22-60 Grizzlies are currently 13-9 in the Western Conference, and the Sacramento Kings are playing like a borderline playoff team. Kawhi is the best player in the East and should help boost the Raptors to the top of the East. Giannis is playing at an MVP level, but the Bucks don’t quite have the depth to top the East. The Celtics look to improve after getting Kyrie Irving and Gordon Hayward back from injury, and the 76ers, now with Jimmy Butler, remain as title contenders. 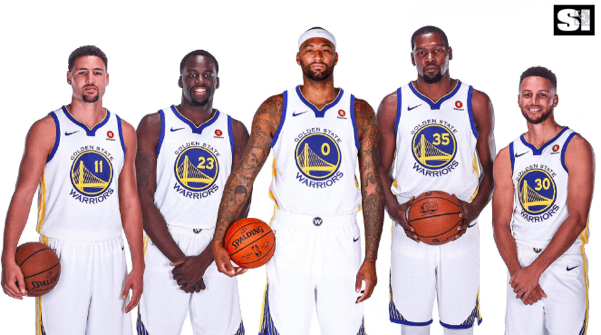 The Warriors’ 5 all-stars make them the best team in the NBA. Houston regresses after overperforming last season, though they should still be able to recover from their slow start. The Spurs and Lakers break into the playoffs after the additions of DeMar DeRozan and LeBron James respectively, and the Nuggets look to contend in the West behind the play of international superstar Nikola Jokic. My pick for MVP is Steph Curry. Steph has started this season on fire as the NBA’s current scoring leader and looks to return to form after a minor left adductor strain. Other stars such as LeBron James, Anthony Davis, James Harden, and Kawhi Leonard either don’t put up as good numbers or don’t compete for good enough teams. Brandon Ingram looks to have a breakout season on the Lakers, and Eric Gordon is a constant 6MOY candidate as a high-scoring shooting guard for the Houston Rockets. JaVale McGee is my sleeper pick for DPOY as he has quietly led the league in blocks. My pick for ROY is Luka Doncic, who is currently averaging over 20 points very early into his NBA career. Ethan is a sophomore Biology major from Houston, Texas who is currently watching the Netflix series The 100 and loves the Genius series “Deconstructed”. Ethan is a huge Rockets fan, your best source for intellectual basketball discussion, and is disappointed that NSC doesn’t have an IM basketball team. Ethan spends too much of his free time looking at sneakers on StockX, and writes for Catalyst to talk about whatever’s on his mind at the moment.